A personal injury attorney handles many motorcycle injuries each year. Sadly, motorcycle accidents sometimes have the most serious personal injuries. Unlike a passenger in a vehicle, a motorist has little protection during a car accident. If you have been hurt in a motorcycle or any other kind of auto accident, contact an auto accident lawyer to find out if you may have a claim for damages. Continue reading to learn how. 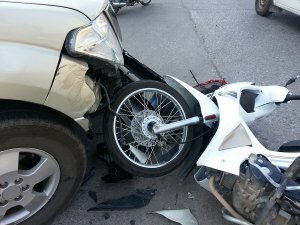 All too often, an accident attorney handles motorcycle accident cases that could have been avoided if the motorists had been paying more attention. If you ride a motorcycle, it is especially important to always be aware of your surroundings. A split second can make the difference between life and death. As you drive, always look for signs that indicate a car may be turning ahead of you. For example, if there is a gap in traffic and a car is waiting at an intersection, make sure to slow down, cover your brakes, and be prepared to act. A gap in traffic indicates that someone can drive through that gap, even if you do not see a vehicle. Auto accident lawyers also regularly handle cases of drivers and passengers hurt because someone was speeding. Speeding is one of the most common causes of personal injury accidents, and motorcyclists are no exception. Whenever you are on the roads, ride at a pace where your reaction time and ability to react to sudden situations fit within your range of vision. By staying at an easy pace, you can be prepared for any obstacles in the roadway, including stalled cars and potholes. A personal injury firm warns all potential clients to be watchful of blind spots at all times. A blind spot is the small area on either side where a driver’s mirror does not naturally reflect. In these spaces, a motorcycle or vehicle driver is completely blind, because it is impossible to see surrounding motorists. Before changing lanes, always look completely over your shoulder, and never rely on a mirror alone.